The first major project we did using 3d Studio Max and our in-house music animation software. 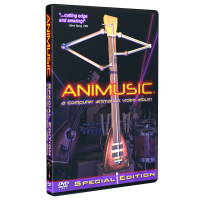 A year or 2 later we re-released Animusic 1 as a “Special Edition” – which featured updated print design, 5.1 surround sound mix, motion menus and additional bonus materials. Dave Crognale: Design details, Principle modeling, Secondary Animation, Digital painting, Shading and Lighting, Camera Operation, Render Management, etc.